This late 6th century gilt bronze bodhisattva is a masterpiece of Paekche statuary from the Three Kingdoms period (1st-7th century CE). Although possessing a highly personal style, it testifies to the opening up of Korea to continental influences. The youthful face with its adolescent charm displays a genuinely glowing, attractive smile-the celebrated Paekche smile-which distinguishes it from the aloofness of sculpted effigies from the neighbouring Silla kingdom (57 BC-668 CE). The body is frail and bare-chested with a slim waist and slender limbs. Sitting Western-style, the bodhisattva adopts the panga sayu sang meditation position: one leg simply crossed over the other, gently bowed head supported by a lightly touching hand, elbow on knee. 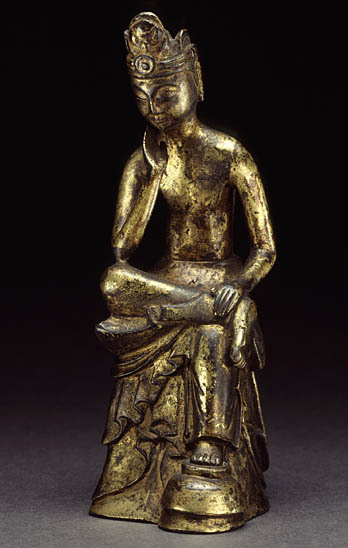 This posture, originally found in the art of Gandhara and transmitted via China, was apparently highly appreciated in ancient Korea, North and South, before being adopted by Japan from the 6th century onwards, as illustrated by the celebrated Miroku Bosatsu in the Koryu-ji temple in Nara. The regularly pleated, frontal hang of the drape, with a “keyhole” arrangement, is reminiscent of that of the Chinese Northern Wei dynasty (386-535 CE). The lines of the drape have been given an extremely soft, flowing treatment, without a hint of stiffness, and this also suggests similarities with Southern China. The bodhisattva is wearing a typical Paekche crown. In the style of North West Indian turbans, it boasts a crescent motif within which an oval-shaped pearl is embedded, revealing influences from farther afield. This sculpture epitomizes the originality of Korean art, as well as the country’s role as staging post on the Silk Route between China and Japan.